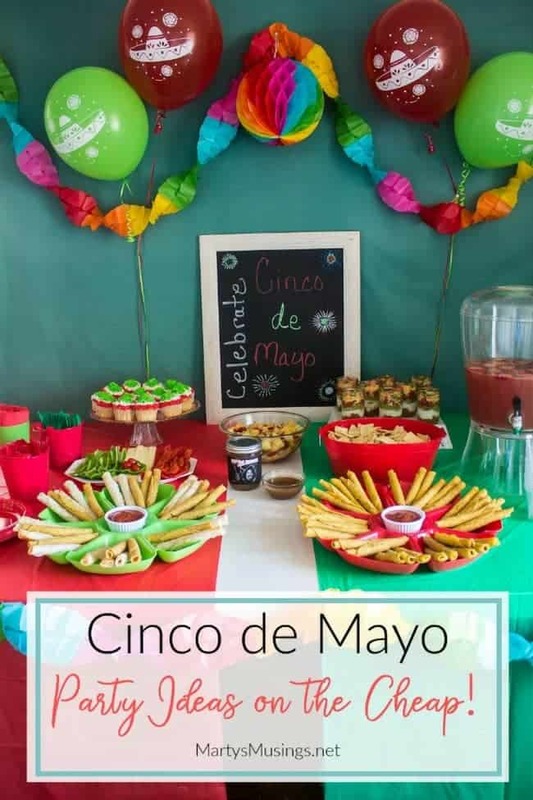 Fun ideas for throwing a themed Cinco de Mayo party on a budget with inexpensive decorations and easy recipes including homemade pineapple salsa. 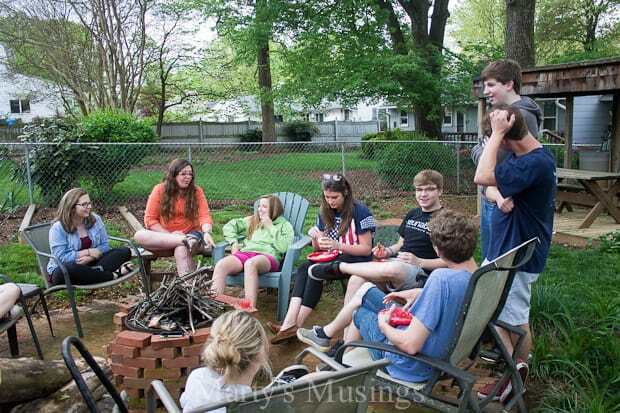 To celebrate my youngest daughter’s 17th birthday she invited several of her friends over for a themed Cinco De Mayo party. 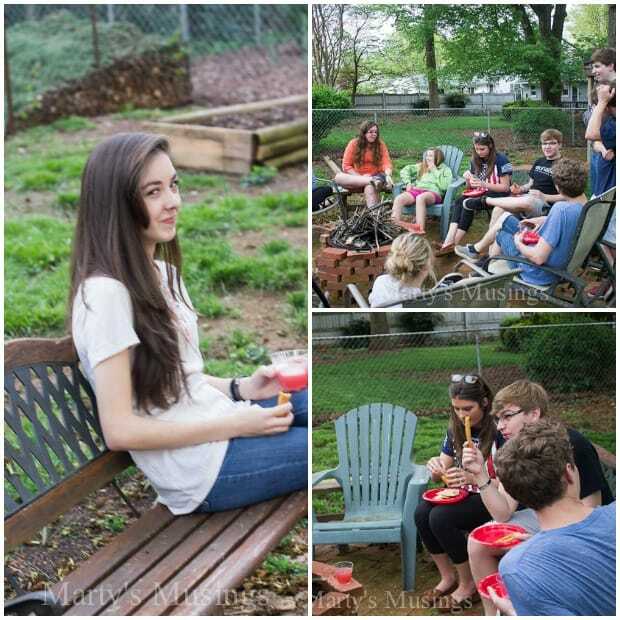 Teenagers + taco bar and fixin’s = tons of food and fun! 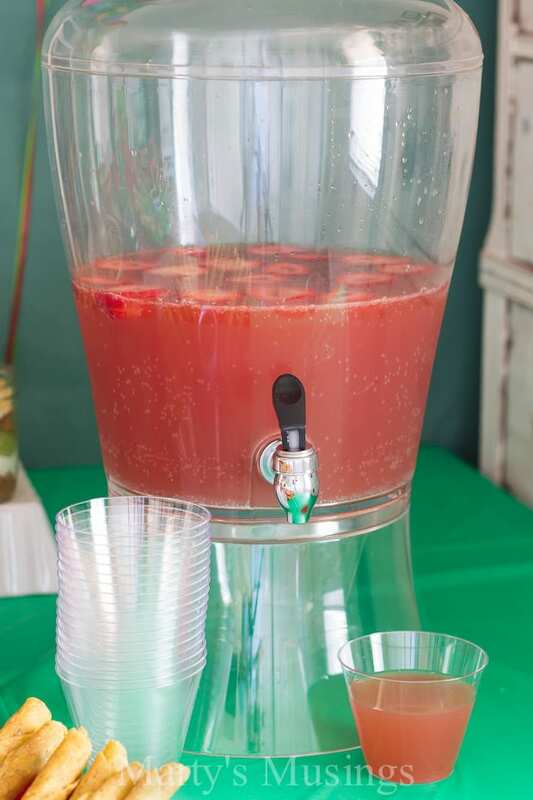 As always, I try to keep my parties to a minimal expense and today I want to share a few tips! Per usual the dollar store and Walmart were my go to party headquarters. 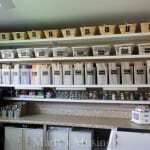 I purchased plastic tablecloths, serving trays, buckets and cups for silverware, napkins and chips. 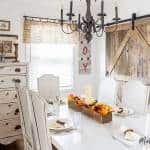 Stephanie had the smart idea to let our white table show underneath to copy the flag theme as well. Smart girl! This $1 chalkboard from a yard sale has been used at a graduation party, sweet 16th birthday party and elephant themed baby shower. I certainly got my money’s worth, don’t you think, with that steal of a deal! 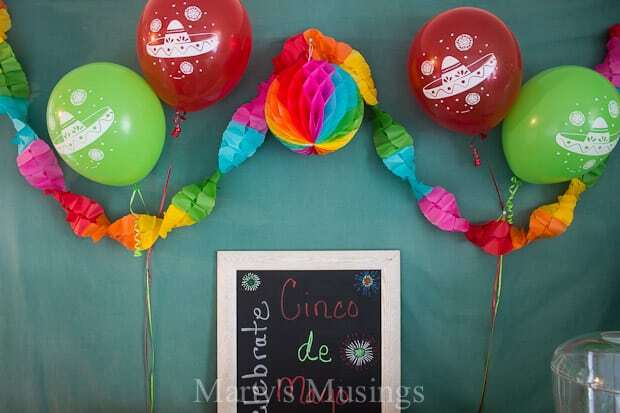 The fiesta streamers and balloons came from Party City and add a festive touch to the party. I also tied some balloons outside so the kids could find our house easily. 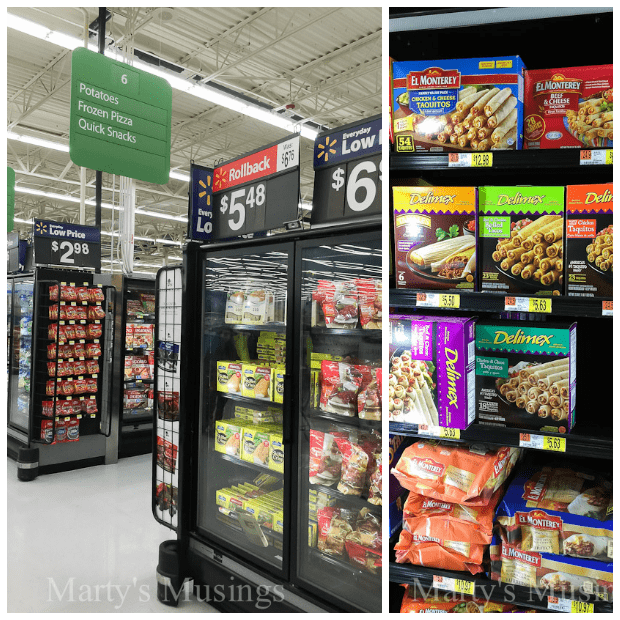 I bought some traditional Mexican food at my local Walmart with Delimex Taquitos and Tacos. 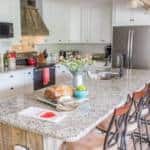 I love to prepare homemade dishes if I can but it’s more important to me that I enjoy my guests and not spend all day in the kitchen. 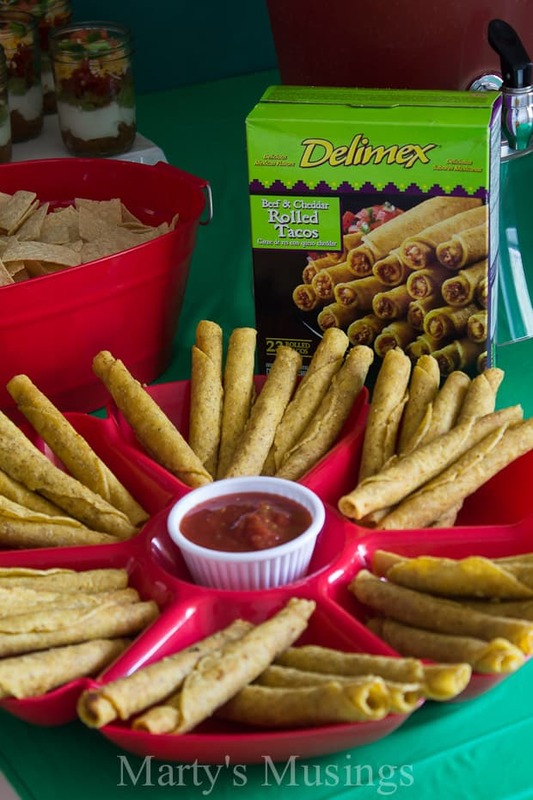 These Delimex Taquitos and Tacos were a perfect choice for teenagers. 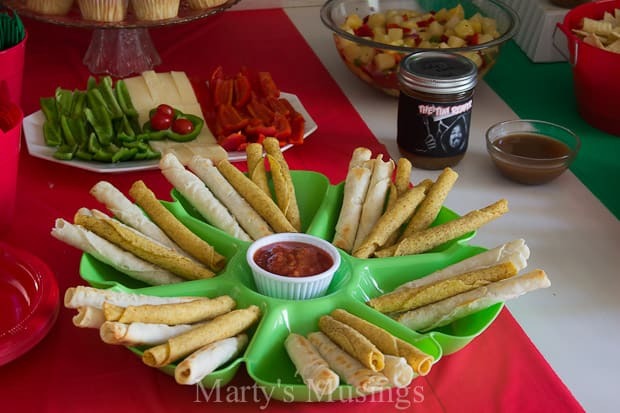 No mess and perfect to grab and go or serve with salsa. I was amazed at how far the taquitos and tacos went. When we have teenagers over I always increase the amount of food served, just to be safe. 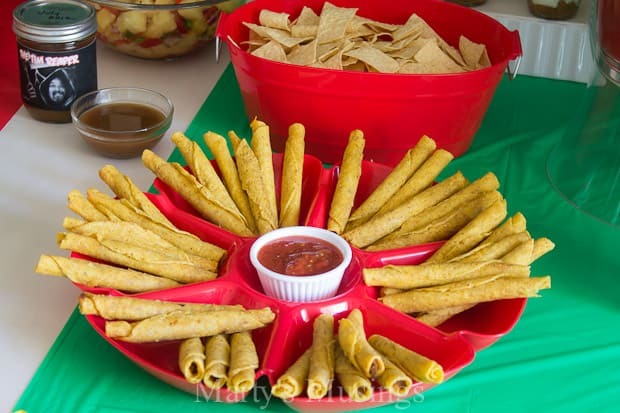 The chicken and cheese flour taquitos were my personal favorite. The one recipe I won’t be sharing? My husband’s hot sauce! I can’t even begin to describe how hot it is. All I can manage to taste is one teeny weeny corner of a tortilla chip. Yes, it’s that hot! He challenges our friends to try it if they’re brave but warns them it can also take the stains off the driveway! 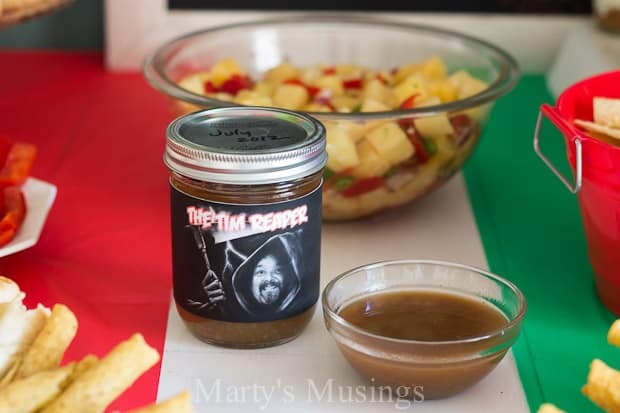 No, not really, but there’s a reason the jar has “The Tim Reaper” on it! 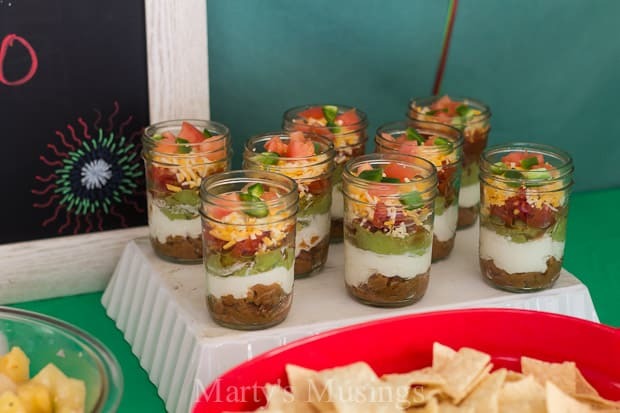 These adorable mason jars filled with a layered dip (recipe coming soon!) tasted as good as they looked and were perfect lunch leftovers as well. I topped them with diced tomatoes and “just” a jalapeño pepper, unlike my husband’s infamous salsa with ghost peppers. 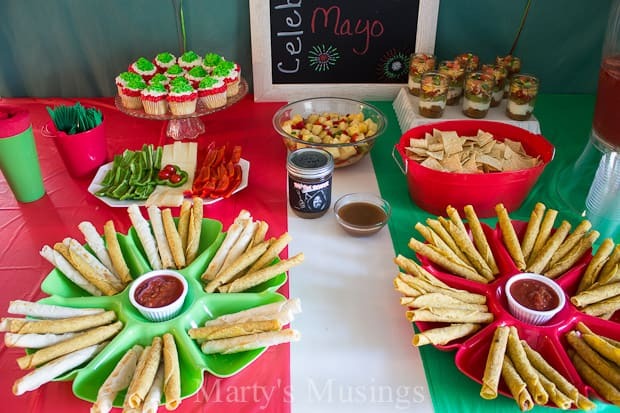 One of the cutest dishes was the Mexican flag (sorry, no closeup) you can see in the background, with sliced green and red peppers, cheese strips and cherry tomatoes on top. Healthy and cute! 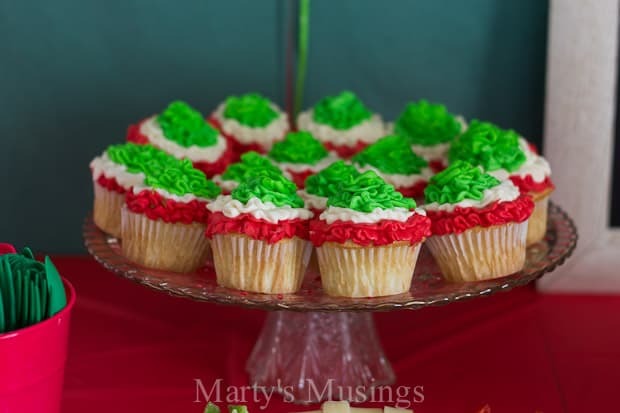 Since she is homeschooled Stephanie has been enjoying exploring all things cupcake related. I am more than happy to let her experiment and expand her cupcake decorating skills! Believe me, these goodies were just as delicious as they are beautiful. 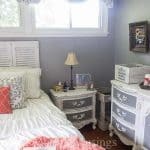 Like the cupcake stand? It’s a candle holder with a glass plate on top! 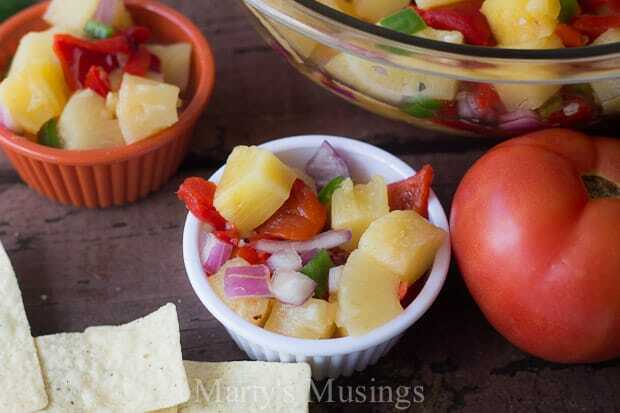 Since I’m trying to add some healthy, easy recipes for snacks I made this Pineapple Salsa that was a definite keeper. The printable recipe is below but I just loved the combination of sweet and a little zip. 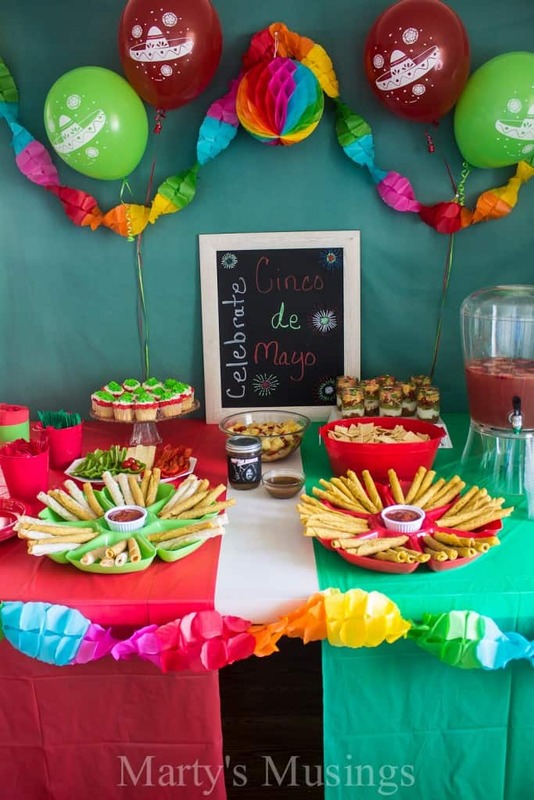 My daughter had a great party and I hope some of our tips and tricks for throwing inexpensive parties will inspire you to celebrate friends and family! 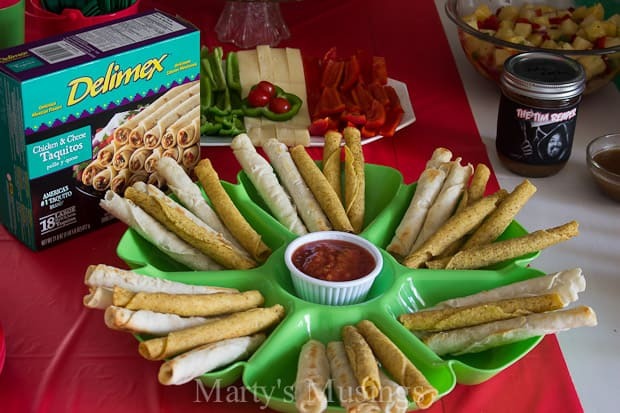 Be sure to check out out more delicious party recipes at DelimexFiesta.com. I’d love to know your favorite! 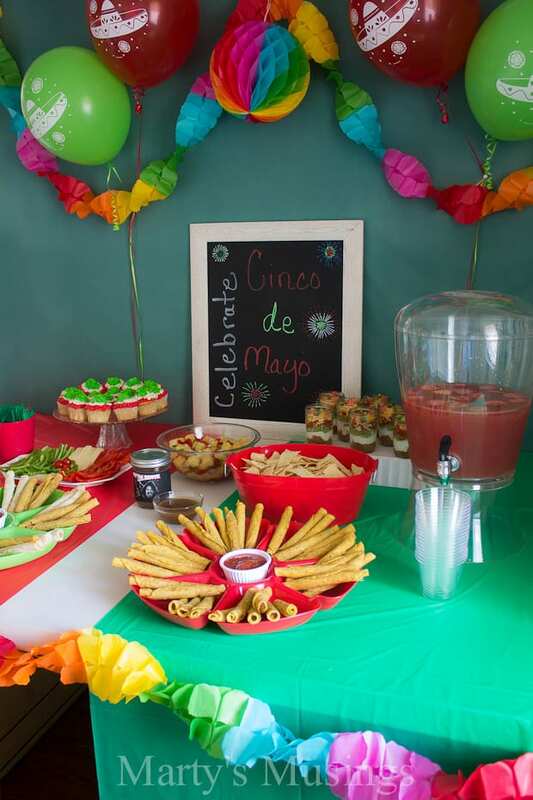 Fun ideas for throwing a themed Cinco de Mayo party on a budget with inexpensive decorations and easy recipes including pineapple salsa and taquitos. 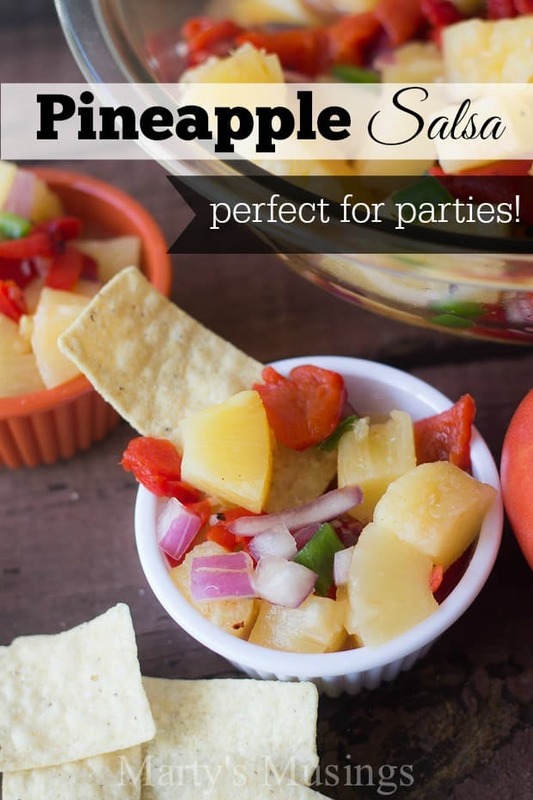 In a medium bowl combine drained pineapple, roasted sweet peppers, red onion, jalapeño, garlic and lime juice. Stir until well combined and salt if desired. 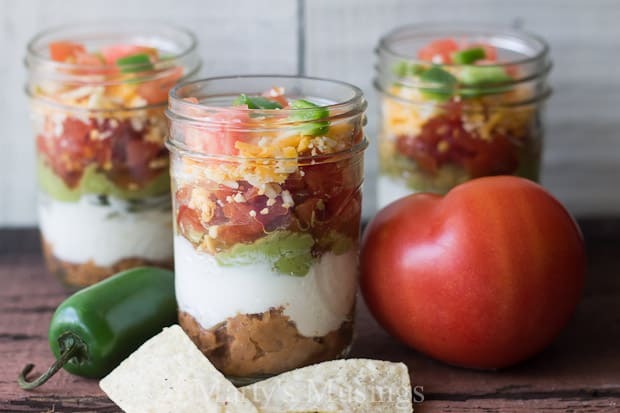 Can be served chilled or at room temperature with tortilla chips. I left out the salt for personal preference. I also didn't have a lime on hand so I used a lemon. 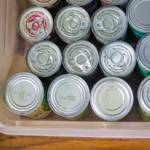 Fresh pineapple can be substituted for canned. Fresh red pepper can be substituted for roasted sweet pepper. 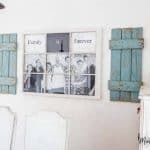 For more party ideas check out my daughter’s 16th birthday party, my husband’s graduation party, our first grand baby’s gender reveal party and the elephant themed baby shower I threw.